UPDATE | Amidst a clampdown on journalists and the closure of private TV and radio outlets in the country in recent months, leading to international criticism, Turkey is increasing the reach of its international news service. Turkish state media channel TRT World is an English language news channel, which first launched in 2015 under the motto "where news inspires change". Based in Istanbul, it has studios in London and Washington, and is the latest state-sponsored international news channel to launch in recent years. The channel appears to be on the brink of launching across Europe with a free-to-air HD transmission taking place on two main satellites today, uplinked on Globecast-operated transponder capacity. According to satkurier.pl, parabola.cz and digitalfernsehen.de, TRT World HD was observed broadcasting free-to-air on the Eutelsat Hotbird satellite as part of the new HD transponder carrying Euronews HD. Simultaneously, the channel was lit up on Astra 1 (19.2 East) - parameters below. Such channels often launch on Astra 1 and Hotbird without the test periods that are common on the Astra 2 satellite used for UK/Irish TV broadcasts, so it's not always clear if a new addition is a test or the beginning of regular service. Initial transmissions on both satellites ceased by the evening, but are understood to be part of the Turkish broadcaster's plans to make TRT World more widely available to satellite viewers across Europe. Earlier this week, Reporters without Borders issued a report indicating that Turkey was now the leader in jailing journalists, having arrested and imprisoned record numbers since this summer's failed coup. 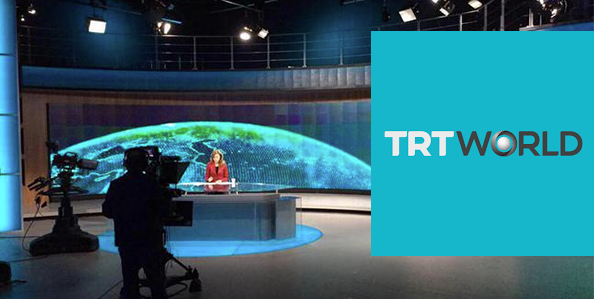 Channels such as TRT World are seen as ways of promoting the official Government line on events to international audiences as a counter-balance to "biased" foreign broadcasters, but critics view them as propaganda stations. Not via standard Sky/Freesat dish set-ups.